wolf Wolves can go two weeks or more without eating and then gorge themselves by eating eight kilograms (20 pounds) of meat, a quarter of their weight, in one sitting.Mech once observed a pack of 15 wolves bring down a 600-pound moose and eat half the carcass in three hours. Wolves often wash after making a kill and compete among one another when eating. They often eat bones, or at least the marrow from them, as well as meat. When there is too much to eat they hide the meat in caches to be retrieved later on. Enough food is saved to feed to ups. Often it is consumed and regurgitated in the mouths of the pups. Wolves eat quickly. If they don't, ravens, vultures and small mammals like martens or foxes that appear soon on the scene will steal away a signifiicant share of the kill. Wolves and wild dogs in Africa often began feeding on their prey before it is dead and people who have observed this find it horrifying. Wolves can crack open bones to feed on the marrow inside. Like bears, wolves will eat garbage if the have access to it. Wolves generally feed on small rodents, mice, rabbits, lemmings, hares, ptarmigans, other nesting birds, fish, seals, wild boar, beavers, ibex, bighorn sheep, elk, deer, moose, musk oxen ad buffalo. Wolves feed on beavers when the forage for food in the early spring. They Wolves have been observed feeding on a bear carcass but they have never been seen killing a bear. Wolves follow he scents and track their prey but more often that not it seems they come across prey in chance encounters they come across when roaming their territories. They availability of prey is often main determining factor determining whether wolves will survive or not in a given area. The size of wolf population is often determined by the number of animals they can feed on. Wolves in the Arctic survive the winter perhaps by scavenging carcasses of animals like musk oxen that haven't survived the winter. In other cold regions, winter is often the best hunting time. Perhaps the wolves greatest skill is appraising victims that it is most likely to kill: Their preferred targets are the young, infirm, elderly or crippled. Their strength, intelligence, and coordinated pack behavior makes wolves very successful predators. On average each wolf takes an average of 18 to 20 deer a year. Still wolves live a feast and famine existence and can go two weeks or more without food. They are also notorious raiders, stealing food from human camps whenever they get the chance. Wolves strike their prey at angles and try to separate weak members from the group and take turns nipping at their prey until it is exhausted and vulnerable. There used to be reports that wolves hamstrung their victims but thus far biologists who have studied hundreds of kills have never seen a severed Achilles tendon. Wild dogs and wolves are not very good sprinters. They have great endurance and capture their prey by relentlessly pursuing them and doggedly wearing them down. Wolves usually attack from behind and the sides, with experienced wolves usually taking the lead, feinting and attacking from opposite sides until a crippling bite or slash can be made to leg muscles that slows and brings the prey down for a killing or incapacitating bite to the throat. Wolves sometimes follow ravens to dead animal. Ravens can not break open the skin of animals with a tough hide like bears so they wait for wolves to show ups and break open the skin. Ravens sometimes peck wolves that act submissive. For protection against wolves, animals like deer and elk group together, seeking safety in numbers. Describing a wolf attack on a herd of elk, Douglas Chadwick wrote in National Geographic, "The wolf pack before us moved from on elk band to the next, taking their measure. Sometimes the elk outran the wolves. One bull elk whirled so fast on a pursuer that a loose antler flew right off his head. Other drew together and stood their ground, warding off incursions with violent kicks." "As an elk foreleg could easily smash ribs or dent a skull, the wolves tried bluff rushes, looking to cause a band member to panic and bolt. We could sense a battle momentum seesawing second by second, the outcome never preordained but rather a summation of each animal's skill, determination, and experience, plus a little old fashioned luck...One morning I watched a n elk disappear over the brow of a ridge with a wolf hanging on each shoulder. Three minutes later it reappeared—seemingly uninjured—and was soon grazing while the wolf pair loped off." "The other wolf, however remained tugging on the calf's rump. The front wolf then dived under the running moose and again fastened onto its throat...Then two more wolves reinforced the attack. One grasped the calf by the nose, and other by its right flank. The struggling moose pulled all four wolves through the snow, then finally collapsed in a heap. A few minutes later the moose's flesh was being converted into wolf's meat." Wolves are the main natural predators of reindeer and caribou. Historically they have fed on the weak, old and infirm and helped the reindeer population by ensuring the strongest produced offspring and the herd as whole didn't overgraze the land. With most of the wolves in Scandinavia now gone the primary controlling agent of the reindeer herds are the Lapps and other reindeer herders. Describing an unsuccessful attack by a wolf on a herd of caribou, Mech wrote in National Geographic,"The herd, sensing the wolf, was drown together as is by some giant biological magnet. The tightly pressed group flowed quickly forward...The white wolf made its decision. Instantly it sprang forward. While stragglers gravitated toward the herd, the wolf began closing the 200-yard gap." "As the wolf pressed close, the caribous increased their speed. Straight toward them the white wolf sped, with legs alternately stretching out then pulling together in 15-foot bounds...The chase covered a quarter of a mile, and the wolf tried its best. Still the hunter was unable to come closer than about 200 feet of its intended prey...Less than a minute after the chase had begun, it was over." Describing an attack of three musk ox calves with eleven 500-pound adults, David Mech wrote in National Geographic, "The musk-oxen bunched together in a semicircle, hindquarters pressed together, protecting the calves. A long standoff deteriorated as a single ox broke ranks, and the heard scattered in small groups that grew increasingly nervous while wolves darted among them, They skirmished until finally the whole herd panicked and fled into a cloud of dust, with the wolves in hot pursuit. "One wolf tests the group, trying to separate the calf from the adults, Protecting their calves a group of oxen try to reorganize but to no avail. Soon the alpha male wolf puts on a burst of speed and grabs the first calf. Within a few furious moments the pack had caught and killed all three calves, including one that stirs competition among the predators." Wolves strengthen the gene pool of their prey by weeding out the old, sick and weak. They provide scavengers with a supply of carrion, especially during the winter when they need it most. 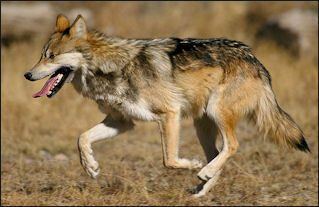 By limiting the size of large herds of hoofed animal, wolves also make sure there is forage and vegetation to feed on. But it is somewhat of a myth that the health of deer populations depend on wolves to cull weak and diseased animals. Studies show that the size and health of deer population is related to snow depth, cold and the availability of food, not wolves. One biologist told National Geographic, "Our data shows that wolves take mainly the youngest deer—those less than a year of age. Old, weak animals are the second most common targets...The herds can handle it" because deer reproduce a lot.